MyFlowerTree, the name brings to mind a wide range of cakes to suit everyone's choice in taste, flavour, looks and price too! 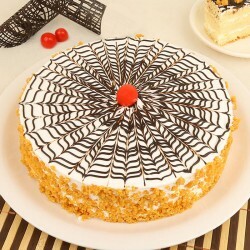 We provide on time cake delivery in Panchkula every time you place an order for a cake and goodies. Having logged into our website, all you need is to scroll through the enormous range of cakes listed and choose from them to send cakes to Panchkula. 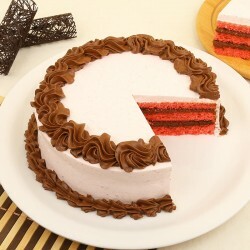 Fill in the day and date for cake delivery to an address in Panchkula without having a thing to worry about the hassle. You might like to try our exotic and resplendent cake offerings like Red Velvet Cake, chocolate Rocher Cake and Coffee Caramel Cake and more. If you are not in for some experimentation, then you can go for evergreen classics like Black Forest, classic Pineapple, Strawberry Almond Cake, Mango Cake and the Fruit Cake. It is time to be health conscious or maybe everyone in your friend circle is on diet. Don't miss out on your bite of sweet joy. We have a sugar free range of cakes just perfect for a celebration with them when you order a Sugar Free Pineapple Gateau Cake or a Sugar Free Belgian Cake. A photo printed cake can be a delight for whoever gets the surprise. Get your selected photo on the personalised cake be it Lovely Strawberry cake, a Birthday Butter Cake or a luscious Photo coffee Cake as an expression of your love. It is a matter of pride that you have placed your trust in us. Our team at MyFlowerTree strives to offer products of excellent quality at prices that are amazingly affordable. We have multiple payment options to make your shopping experience with us an enjoyable and hassle free. The order procedure is easy to browse and navigate. The selection of cakes in all their resplendent glory are top notch in terms of price, design and flavour. We are sure you will find a perfect option from the collection which has everything ranging from cupcakes, theme cakes, tea cakes, cakes in a jar and tier cakes. Nothing can match the ease of online delivery of cakes. The best part of online delivery is that you can go for same day cake delivery in Panchkula. Surprise everyone and treat them to that sweet something post dinner by ordering a Cookie Butter Cheesecake for your home address. You can opt for next day delivery, same day delivery. Be the first one to wish a happy birthday with a midnight cake delivery in Panchkula. You want to be different from the run of the mill, so we have unique gifting ideas that come as individual gifts and combos also. Fresh flowers, delicious chocolates, soft cuddly toys, personalised mugs, customised cushions and a long list to choose from. 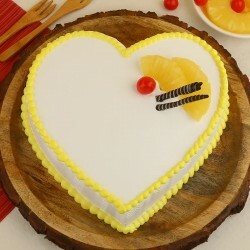 Spoil and shower your loved ones with happiness and order an online cake delivery in Panchkula.